Let's put to rest the myth that an Apple computer will set you back more than a Windows PC. In fact, it'll cost you less. It's time to buy an Apple computer. Indeed, it's been that time for the past five years, at least, but only now, slowly, are people waking up to this fact. Thanks to Apple's relentless flash -- the John Hodgman ads, the iPods, the iPhones -- its Macintosh business is now in league with that of the biggest PC companies in the world. Everyone who's used it agrees that Leopard, the operating system that Apple released late last month, is to its chief rival, Microsoft's Windows Vista, roughly as Richard Wagner is to Richard Marx. This simple truth is dawning: If we forget about computer-industry network effects and monopolistic business practices, if we forget Apple's various ancient missteps -- if we're going just by what's better -- the ages-old Mac-vs.-PC debate is over. Long over. Yell it from the rooftops: The Mac has won. And yet, you're not buying an Apple computer. Most of the world isn't. There is probably a single overwhelming reason you're clinging to Windows. Macs are expensive. This is what you've been told, and in your research, it's seemed to check out. If they acknowledge it at all, Mac fans will rationalize the higher prices by noting that you're paying for quality. Buying a Mac, folks say, is like buying a BMW (Apple CEO Steve Jobs regularly compares the Mac's market share with that of German luxury cars). But what if you don't want the BMW of PCs? What if you can only afford a Chevrolet? The present article is an attempt to prove to you that, on price alone, the Mac is not the BMW of computers. It is the Ford of computers. I am not arguing that the Mac is cheaper only if you consider the psychic benefits conferred by its quality. Rather I'm going to illustrate something more straightforward: Even though you may pay a slight premium at the cash register for a Mac over a comparable Windows PC (a premium that gets slighter all the time), it will cost you less money -- real, honest-to-goodness American dollars -- to own that Mac than to own that PC. Why this should be has to do with an economic truth that has not recently mattered much in the computer industry, but that, in an age of eBay and unyielding obsolescence, is now crucial. It is resale value. Macs fetch far more on the aftermarket than do PCs -- and after years of use, you can offset that cash-register premium by selling your Mac for a better price than you could your PC. Consider this example: Last Thanksgiving, you could have purchased a fairly well-outfitted Windows desktop -- the HP Pavilion Media Center A1640n -- on sale from some retail outlets for $699. The machine came with 2 gigabytes of memory, a 250 GB hard disk, and it ran on a quick 1.86 GHz Intel Core 2 Duo processor. Around the same time, you might instead have picked up Apple's top-of-the-line Mac Mini, which came equipped with a processor slightly less powerful than the HP's (a 1.83 GHz Intel Core Duo), a far smaller hard disk (80 GB), and less memory (512 MB). The Mac Mini would have set you back $799, or $100 more than the HP. A good way to gauge the current market value of a computer is to check how much buyers have been willing to pay for similar models in auctions recently completed on eBay. Doing so for the HP shows prices ranging from $236 to $257 -- let's say a rough average of $250. Sales of the Mac Mini, meanwhile, go from about $445 to $550. Let's assume you can unload yours for $500. If you used your HP for a year and then sold it, you would have spent $449 to own it -- that is, your purchase price of $699 minus your sale price of $250. The Mac Mini, for the same year, would have set you back far less: $799 minus $500, or just $299. I ran such comparisons on many Windows and Mac systems sold during the past four years, and in nearly every one -- whether the machines were laptops or desktops -- the Macs sold by enough of a premium over comparable Windows machines to make up for the greater amount you would have paid when buying them. In the spring of 2006, for instance, you could have purchased a nice Dell laptop -- the Inspiron E1505, with a 1.66 GHz Core Duo processor, 1 GB of memory, and an 80 GB hard disk -- for $999 directly from Dell. At the time, Apple's roughly comparable entry-level MacBook -- 1.83 GHz Intel Core Duo processor, 512 MB memory, a 60 GB disk -- went for $100 more, $1,099. Even if you'd treated your machine very well, you'd be lucky to sell the Dell today for $550, while MacBooks have recently sold for $710, $740, $790, and even $800. It would, in other words, be a cinch to sell the MacBook for $100 more than the Dell Inspiron, thereby making up the purchase-price difference you paid earlier (and likely even beating it). Apple fans have long understood the amazing resale value of their machines. Windows users, on the other hand, might be scratching their heads at my argument; in the Windows world, selling your computer (rather than recycling it) is almost unheard of. After just a year or two of use, a Windows machine gets so gummed up with spyware, viruses and other nasty stuff that it seems malicious to ask anybody for money for the thing. When I say that it is time to consider buying an Apple computer, what I really mean is that it's time to consider that computers can live longer than what we in the Windows camp are used to. It's time to realize that a 2-, 3-, or even 4- or 5-year-old machine is still intrinsically useful -- if not to you then to someone else -- and you'd do well to take this value into consideration when choosing what to buy. Last year, the Web entrepreneur Daniel Nissanoff published an intriguing book called "Future Shop," in which he argued that by making all goods more "liquid," eBay and other auction sites would profoundly revolutionize how we shop. The coming "auction culture," he writes, "will shake up the status quo by reshuffling brand values according to how well a product actually sells in the secondary market." Instead of choosing what to buy based on its price tag, we'll take into account "how much it will fetch on eBay next year, which corresponds to how much it will really cost you to own it up until then." Tech geeks tend to purchase computers as if brands don't matter. As long as the specs are in order, they argue, you can buy a bargain-basement PC and rest assured that it'll work out for you -- the logo on the case doesn't mean a thing for how it runs. Nissanoff's thesis -- not to mention the completed sales on eBay -- upturns this argument. Even for computers, brand matters. This week I compared prices of several machines from Dell, Gateway and other PC vendors against Apple's lineup of Macs. 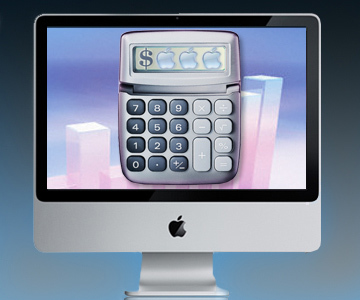 In most cases comparable Macs sold for within $100 more than the PCs. But the Apples had something extra: that logo, the design, the history, the clutch of fans willing to snap up any products the company makes. You'll need another computer in a year or two, and at that time, when you go to sell your current machine, Apple's intangibles will count for a great deal -- much more than $100.